Rig Veda, Atharva Veda and Taittiriya Samhita (Shaka of Krishna Yajur Veda) mention the names of many kinds of animas as well as a few varieties of birds, reptiles, worms, insects, and fish. Thus, there was the presence of zoology in the Vedas in Hindu Religion. Animal classification in ancient Vedic India is minimal. Taittiriya Samhita classifies animals as those supported by bones and those supported by flesh. Ivaja (viviparous) – mammals belong to this group. Andaja (oviparous) – reptiles, insects and worms belong to this group. Udbhijja (of vegetable origin) – minute organisms belong to this group. Anatomy of ox and of the horse is described in detail in some scriptures. Some classification based on color, teeth, form and anatomical structure were described. Birds and animals were studied in detail as their images were widely used in Vedic Yajna. 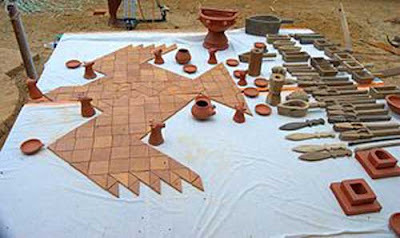 The Vedic havan for Athirathram yajna is designed in the shape of a flying falcon. Various animal shape vessels were also used in Vedic yajna. Anatomy was studied during the Vedic era.